Ur deffo my go to guy for a light mate no danger I will at least no it’s from the man who puts them together did u finish the light for gaz ! I did bro he's running it now. He did post on the cola cob build for gaz when he put it in I think. Hello, I am from Europe, specifically with the Czech Republic, so I want to ask the problem will not put the QB288 on 220v? The meanwell drivers work on both 110 and 220 VAC input. Congratulations! 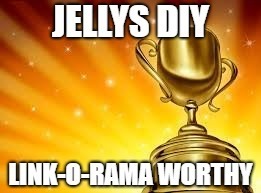 You've made Jelly's DIY LINK-O-RAMA!